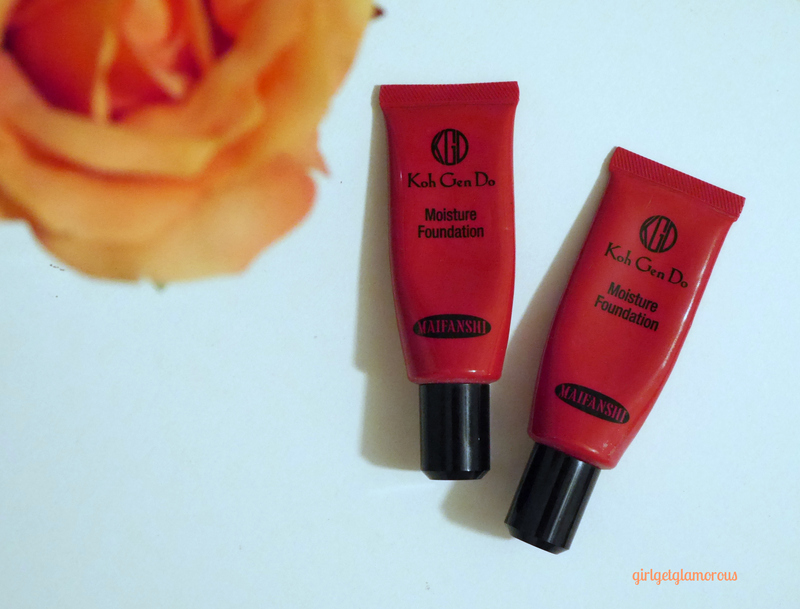 The Koh Gen Do Mainfanshi Moisture Foundation is one of those products that I’m actually can’t believe I haven’t blogged about yet. I have countless stories about how amazing this foundation is, I actually feel guilty for not having shared it sooner. It is an incredible foundation from Japan. The foundation has been a best seller for the company for over 20 years. It was a total makeup artist’s secret for a long time. When I was an actor, I could spot the little red tube on set from a mile away. It’s gained popularity in recent years and now is more readily available at Nordstrom and Beautylish. Fun fact: Each tube takes over 3 times the normal length of time to make foundation because of it’s special formula. The Moisture foundation retails for $62 for .71 oz. It is definitely a luxury foundation, and I will get more into why I think it is worth every penny. When I became a makeup artist, I was invited to a private sale of another artist who was moving cross-country to NY and was selling the unused back up products from his kit. He had an ENTIRE living room full of brand new products, just waiting to be used. It was nuts. I had been wanting to try these foundations forever, so I grabbed two. That was in March 2014 and I am still not even 1/2 of the way through the 002 shade and I still have 1/4 a tube of 113. It is a super concentrated formula! I have about a zillion stories to tell on why I love these foundations, but I want to do a proper review, so I will save them for the end! 10/10 points for packaging. The foundation comes in a red plastic tube. I absolutely LOVE this tube, because I can shake and squish the product around inside the tube before using it, to make sure it’s really mixed up. And if you don’t think I’m going to cut the top of the tube off at the end to get a few more wears out of it, then you don’t know me anymore. I’m 100% going to do that. I love plastic tubes. They are also really lightweight, great for a makeup artist lugging around 8 tubes of them or someone who likes to travel light on vacation. The finish is what totally sets this foundation apart for me. It took me a few tries and combinations of amount, blending, and primers to get my perfect coverage, but once I found it: magic. The coverage is very sheer, but not light. If that makes sense. This covers and evens out skin, but in a very sheer formula. What I love is that it’s a very thin formula, so you can build from one layer (sheer coverage – what I use on male actors/client’s who request light foundation and medium to dark skintones), two layers gives beautiful medium coverage, and I personally use three ultra layers to give me full coverage that never looks like a mask. I have a lot of redness (might try their yellow base first soon) and I am very fair to light, so you can see the discoloration in my skin more easily than on a medium or deeper skin tone, in case you were wondering why I prefer full coverage. But that is what is so great about this foundation, on days I am more tan, I use two light layers, other days I can use three. It’s completely customizable and never looks cakey. I love it on male actors because it photographs and films like skin. So it never looks like they are wearing makeup. The finish is phenomenal. I do set mine with a setting spray for extra wear-time. I LOVE that this is a moisturizing formula. It’s actually really hard to find a foundation that hydrates. The formula is a concentrated cream. You need only a very small dot to cover your entire face. I use three small dots for full coverage. I’ve had my tubes for-ev-er. Forever. This is one of those products that is initially a bit more costly, but in the long run a fantastic value. As I get older, I’m finding I have to be more careful of using certain foundation formulas. I can’t go too heavy or too matte, because they really accentuate my find lines around my eyes and forehead. I adore this foundation for softening the look of those lines both in real life and in photographs. Let’s talk photography. Holy Heck. This stuff photographs and films like a dream. I mentioned above that this foundation was developed when high definition (HD) cameras started being used in tv and movie filming in Japan twenty years ago. I don’t know how, I really can’t figure it out, but this just really does look like skin and not foundation on camera. Brides, take note. I have dry skin, so the hydrating finish is perfect for me. My skin never looks taut or flaky. In the summer, I wear in with the Hourglass Mineral Primer and that gives me oil and shine control. The rest of the year I wear it either with Laura Mercier Hydrating Primer (if I’m going to be inside) or Laura Mercier SPF primer if I’m going to be outside. Koh Gen Do has their own primers as well, which I will be trying next from them. As I have dry skin, I can’t totally say if this finish will work with oily skin. I would say it is worth a shot with a primer like Becca Matte or the Hourglass, as both Sephora in store and Koh Gen Do online do samples. So you could try the foundation first with those or your favorite primers or on it’s own or with a setting spray to see what and if it works for you. I can say that this foundation has held up for me in humid, 100+ temps for 6-12 hour days without stopping. One of the things I love about the formula is how pure the ingredients are. The makeup products are all made with skincare level ingredients, so your skin is actually improving as you wear it. I was surprised when I found out that they use more natural ingredients, because the formula really holds up well all day! • Infused with 80% moisturizing ingredients. • Hydrolyzed Yeast Extract (Collagen) and Aloe Barbadensis Leaf Extract hydrates and conditions the skin. • Optical smoothing with the leading edge powder technology. T3 Oil – Our special treatment blend of 3 pure botanical emollients (Jojoba Seed Oil, Olive Squalane & Shea Butter) created originally in our Azabu Facial Salon in Japan as one of the key component in skin care. T3 Oil has a high affinity and beneficial properties for the skin leaving it soft and supple. • Gluten-friendly, Not Tested on Animals. This foundation was created by a Japanese actress over 20 years ago, to wear for HD filming. Days on set are loooong, so this foundation was developed to last. It hold up for me and on others for 12+ hours days with minimal blotting and fading around the nose. With a setting spray, I find that I only have to use a blotting paper mid-day on super hot days. To me, the only downside of this foundation is the slightly limited availability of shades. Fair and light skin are well taken care of, but medium and dark skin ladies, I had trouble finding the deep shades in stock online anywhere. Maybe they are reformulating the dark tone shades? I purchased shade 002 and 113. I use 002 whenever I am my natural fair skintone. I use 113 whenever I have a fake tan. I mix the two shades together a lot as well for the in-between times. I feel like I look the most natural when I combine two drops of the 113 with one drop of the 002. A “drop” for me is less than half the size of a frozen pea. 1// I used this makeup on set on an actress while we were shooting minimum 12 hour days. They were mostly longer and it was around 100 degrees every day. The makeup not only held up, but it reversed her breakouts from a drugstore foundation another artist had been using on her face. On this same movie, I used it on an actress with more mature skin. I just saw the cast and crew screening of this the other day, and her skin was glowing on the big screen. It was such an awesome and satisfying work experience to see her look that great and her skin look so smooth and fresh. 2// I brought this and ONLY this foundation with me to one of my best friend’s weddings in Miami. In August. I love her, but I legit thought I might be dying the entire weekend. I’ve never felt heat like that. I brought only this foundation, unpacked my makeup bag and thought “WHY.” It was so hot and I brought a moisturizing foundation!? I was baffled at my own decision. But I swear, it held up like nothing I have ever seen before. You know those pictures from the end of the night at a wedding? The ones where at that point, you’ve convinced yourself that this is the best you have EVER danced and every photo comes back of you with a drink in your hand? Yeah, those. Well, it was a harsh reality to see that I my dancing was not at it’s peak, but I will say my skin looked great in those pics. I had also cried several times that day/night like a giant, gushing baby. My friend’s first dance was one of the sweetest things I’ve ever seen. It honestly makes me tear up every time I think of it, it was such a beautiful moment. Also, it was hot. Did I mention that it was in Miami in August? Oh I did several times? I don’t know how this stuff stayed on my face but it did all day every day. Which was great, being that it was literally the only foundation I packed. Such a great choice and I would absolutely do it again for my next trip. 3// My birthday two years ago/every photo of me that I have seen while wearing this Moisture Foundation my skin looks rad. I got the pictures back from my birthday when I turned 32 and not gonna lie, my skin looked good! I looked really fresh, but also somehow still matte. Usually I kind of dread getting those random pictures sent to me, but I will say that year was a blessing. I’ve noticed that my skin looks glowing, but not oily in every picture with the Koh Gen Do. I pile a quite bit of it on and it always just still looks like I have flawless skin. I’m not trying to toot my own horn here, I’m just amazed at how much it covers while still looks natural. Even my light acne scars. It’s impressive. This is such a fabulous find. It does take some experimenting to find your right coverage level, but once you find it, you’ll be a happy gal. My skin looks so much younger when I wear this and foundations and concealers are the one thing I always change daily. I’ve noticed this fall and winter, I’ve been reaching for this one way more often. I would repurchase this foundation and intend to try the Aqua foundation as well. For me, a repurchase is the biggest stamp of a approval a product can get. I’m always on the hunt for the next greatest-and-latest thing, so when I am fully ready to repurchase a product, that’s a huge deal in my world. This foundation is such a great product and I am so happy that it is starting to get the mainstream love and recognition it deserves! Now for the photos! I swatched both the 002 and 113 shades for you, I hope the pics help! Let me know if you’d like to see any more. Thinking of filming a tutorial on this eye look! You can find Koh Gen Do Moisture foundation online at: Beautylish and Nordstrom. You can order samples from the Koh Gen Do site. Thank you so much for reading! I hope this review was helpful, let me know if you try this foundation and what you think! What is your go-to winter foundation? Definitely do the eye tutorial! Love the colors! Ok, thanks, Megan! I will for sure, I’ve been wearing this look a lot lately… xo!